The remarkable true story of the largest mass surf rescue in Australia’s history. 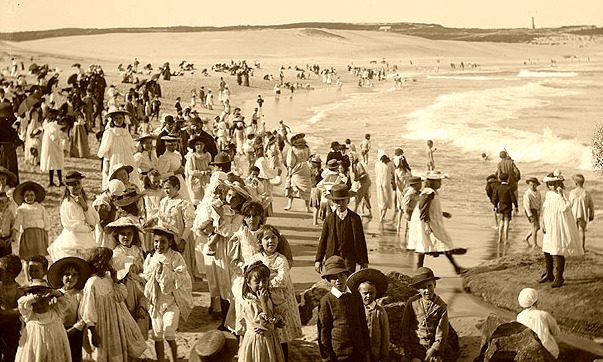 Sunday the 6th February 1938 began as a normal summer’s day in Sydney. Since early in the morning on popular Bondi Beach, an estimated crowd of 35,000 Sydneysiders had been enjoying the soaring temperatures. The mood was festive, as the city had recently celebrated Australia’s one-hundred-and-fiftieth anniversary with a jubilant parade titled "Australia’s March to Nationhood". The ocean was dotted with bathers cooling down in the water. Hundreds were paddling, swimming and bodysurfing on the sizable waves that were breaking regularly about 30 metres offshore. The surf was heavy, and 74 people had already been pulled (unharmed) from the water by lunchtime. One well-known local surfer, Mr S. Platt, described the conditions on the day. "It was a peculiar surf. People who understand surfing could handle it all right. The waves were fairly ordinary dumping ones, with a heavy curling crest on them. They were the sort one has either to dive under or sink down to the bottom until they passed. "There seemed to be a terrific tow or back-lash to the waves. Many people who were not strong surfers would be carried out in about two yards by the broken dumpers, and would then be carried out farther than the wave had taken them in. It was definitely a queer surf, and one for strong swimmers." Despite the dangerous surf conditions, Waverley Council beach inspectors Aub Laidlaw and Tom Meagher had opted to open the beach, mindful of the large crowd who would wish to seek relief from the oppressive heat. They had designated a safe swimming area directly opposite Bondi Pavilion. The familiar red and yellow flags were placed 70 metres apart. As the tide dropped, more and more people ventured out to an unusually large sandbank that ran parallel to the beach. The sandbank meant beachgoers could advance quite far from the shore, while still remaining in waist-deep water. Numbers in the water and on the sand continued to escalate. Lifesavers wondered how they would find space on the congested beach for their weekly surf competition. As the crowd on the sandbank swelled, nervous lifeguards grew more active, recognising that the situation in the water was becoming increasingly treacherous. They repeatedly blew on their whistles, directing complacent swimmers towards safer areas. By early afternoon, the temperature had reached approximately 40 degrees Celsius, and there were an estimated 800 bathers in the ocean. 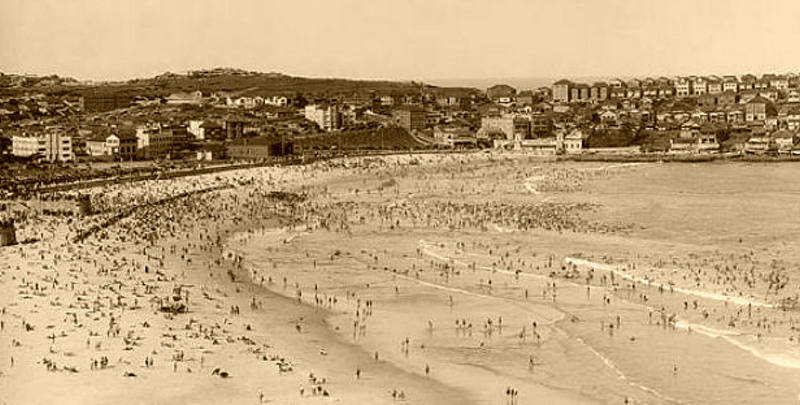 Then, as the low tide fell shortly after 3:00 p.m., an eerie quietness descended on Bondi. An unusually long lull settled in. The ocean paused, strangely silent. Suddenly the lull was broken. Without warning, a series of half a dozen exceptionally large waves thundered towards the beach in quick succession. The powerful waves swept relentlessly over the swimmers on the sandbank, terrifying hundreds and knocking them off their feet. As each wave surged onto the beach, the next wave followed immediately behind. The interval between waves was insufficient to allow the incoming water to recede. The volume of water on the beach banked up alarmingly. Once the sequence of enormous waves came to an end, the immense volume of trapped water retreated rapidly from the beach. The formidable backwash swept everything it had engulfed back into the ocean. Approximately 250 people were washed into a deep channel and carried out to sea. There was instant mass hysteria as men, women and children fought for their lives, grabbing and clawing at each other in the frenzy. Back on the beach, stunned lifesavers urgently sprung into action, sprinting to the water’s edge with seven surf rescue reels. 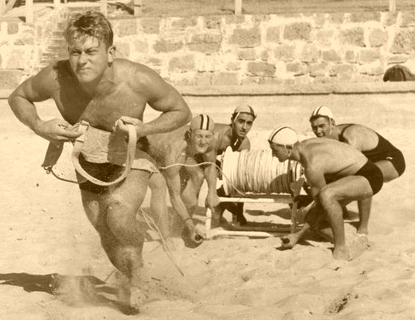 The Bondi beltmen rushed into the ocean. At first they attempted to reach those who had been swept out the farthest, but their lines were immediately besieged by panicked beachgoers closer to shore. The beltmen found themselves swamped by swimmers, often having to punch through walls of distressed bathers to reach others in yet greater danger. As dozens of desperate and exhausted swimmers swarmed on top of their would-be rescuers, the lifesavers on the beach, fearing for the safety of their now submerged companions, began to haul them ashore. One beltman, George Pinkerton, required medical attention after being dragged underwater by members of the public. Another, Arthur Elm, said that when he reached one group who were among those farthest from shore, he was seized upon by five men who refused to let go. "Some of the men seemed to go mad. I was trying to take the belt to a youngster who was right out but I didn't get the chance. As I went by, dozens yelled for help and tried to grab me. I told them to hang on to the rope as soon as I had got it out, but they didn't wait. They made for me. "I didn't think I had a chance when they all came at me. One grabbed me round the neck, two others caught me by one arm, another held me round the waist, and another one seized my leg. I hit the man who had me round the neck. I managed to get in on his chin, and he let go. I had to do it. But for that I would have been drowned myself, and some of the others too. I know that scores of us went back to the beach on the line but I can't remember much about that part of it." Fear spread like wildfire as the public began to realise how dangerous the situation had become. Newspaper reports describe the chaos on the beach, as frantic relatives and friends tried to assist their loved ones, often hindering rescue efforts in the process. Members of the public heaved on the rescue lines, causing some to snap, leaving rescuers and their fatigued patients in even greater danger. Fortunately, a large number of Bondi clubmen had arrived en masse to compete in the regular Sunday afternoon club carnival. 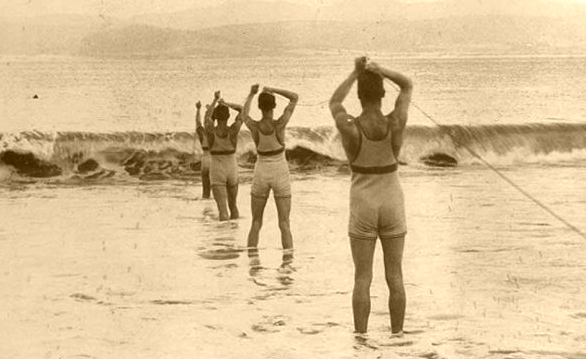 Over seventy of them followed the beltmen into the ocean, grabbing rubber floats from sunbathers to use as rescue aids. Others used surfboards and surf skis, or dived unaided into the maelstrom. Amidst the turmoil, rescuers swam from one panic-stricken bather to another, helping clutching hands to grasp floats and lifelines. The lifesavers worked tirelessly, towing back to the beach those who had been dragged seawards, and pulling submerged victims back to the surface. Asher Hart, the local club champion, paddled out on his surf ski, which promptly capsized as frantic swimmers grabbed onto the sides. However the upturned keel still offered sufficient floatation for many patients who clung to the edges until other lifesavers could provide assistance. Rescuers noted one peculiar feature of the tragedy – the remarkable composure among the women, and the contrasting panic among the men. “The men were crying like girls, shrieking with terror and shouting wildly for help”, said one lifesaver. “On the other hand, the girls were calm, and seemed to wait quietly, keeping above water as best they could until they were rescued”. Within a few minutes, Bondi Beach resembled a battleground, with unconscious bodies strewn along the shoreline. Of the 250 victims plucked from the water, rescuers had to perform CPR and first aid on approximately sixty patients. Tom Meagher, Waverley Council's Chief Beach Inspector, painted a vivid picture of the event in his eyewitness account (extracted from Labor Daily, 7th February, 1938). “About eight additional surf reels were brought down from the Bondi Surf Bathers’ Life Saving Club anticipating that trouble might come quickly. “Shortly after 3.00pm following a slight lull in the incoming waves there followed a run of about five or six really big waves in quick succession. These waves swept through the bathers knocking many of them off their feet and frightening them badly. As each wave surged high up the beach the next followed closely on it. There was not the usual break for the water to recede. “The result was, that with such a volume of water high up on the beach there naturally followed a terrific backwash that swept everything before it and we estimated that about 250 were swept off the sandbank, where they had been standing in water about waist deep, into the deep water of the channel. “Fortunately none of them were more than about 70 or 80 yards from the shore, but to get about 250 people clawing and grabbing in indescribable panic, out of the surf was one that had not previously been attempted. “Just about this time about 70 or 80 Bondi Surf Bathers’ Life Saving Club members had come down from the Clubhouse on the beach to take part in the weekly surf event. In a moment all hands were in action. Beltmen took every available line out, many went in without belts and held up struggling bathers. There had been no precedent for such a large-scale surf rescue effort. No lifesaver had ever seen such pandemonium – the ocean so crowded with drowning people. Yet the rescuers performed heroically, spontaneously putting their training into action and risking their own lives to aid countless strangers. The initial rescue operation to recover swimmers from the water and perform CPR took roughly half an hour, and there was also substantial effort involved in managing people on the beach. Resuscitation efforts were hindered by the tremendous crowd, as thousands of desperate beachgoers ran from one patient to the next, trying to locate their missing friends and family members. 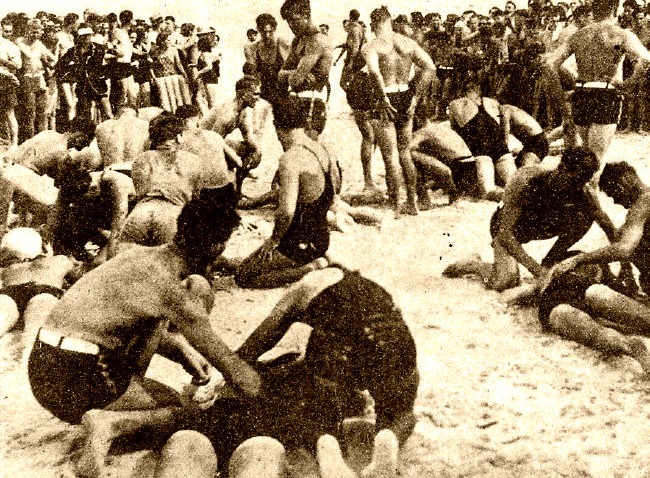 A human chain was formed to restrain the crowds, separating anxious bystanders from those being revived on the sand. As patients regained consciousness, they were carried to the Bondi Bathers Clubhouse, where warmth, nourishment and first aid could be provided. The hastily summoned local police force was overwhelmed, calling for reinforcements. 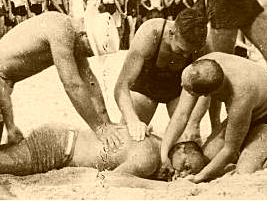 A radio broadcast appeal brought additional doctors, policemen, ambulance officers and first aid assistants to the beach. The colossal effort paid off. In the end, only five men lost their lives. The deceased were Bernard Byrne, Ronald McGregor, Charles Sauer, Leslie Potter, and Michael Kennedy. Considering the scale of the disaster, it’s remarkable that only five men drowned. One victim, 53-year-old Carl ‘Sweety’ Saur, a German-born chef from East Sydney, died while rescuing a little girl. This extraordinary event has become known as Black Sunday. To this day, it remains the largest mass surf rescue in Australia’s history. 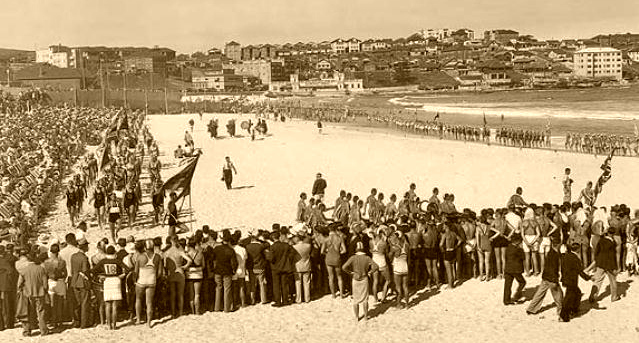 The death toll resulting from the sudden change in surf conditions would have been far greater had the Bondi Bathers Surf Club not been holding their carnival that day, ensuring a substantial number of lifesavers were present on the beach. No individual awards were handed out in connection with Black Sunday, since no one person could be singled out – the lifesavers had performed as a single cohesive unit. Instead of recognising individuals, the Surf Life Saving Association of Australia recommended the entire club for a special Meritorious Award. 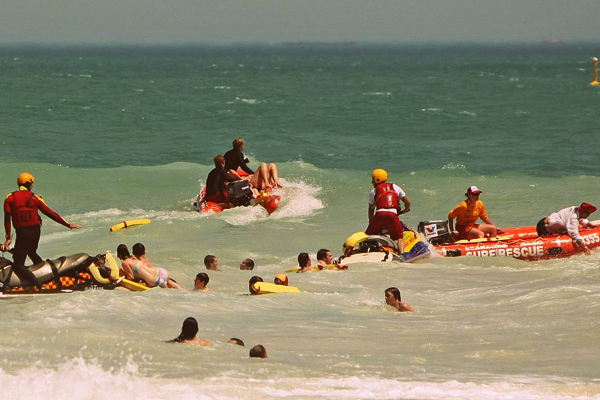 The tragic incident became a transformative moment in Australian surf lifesaving history. It redefined the term ‘mass rescue’ and triggered the development of modern mass rescue procedures. It prompted the construction of new roles, methods, and equipment to ensure lifesavers would be better equipped to face similar situations in the future. At the inquest, Club Captain Jeppeson said the lifesavers merely fulfilled their duties, just as the police and ambulance men had done. However the coroner, Mr Oram, highlighted one notable point of difference. While ambulance and police officers are paid to carry out their duties, the lifesavers were unpaid volunteers, which lent additional distinction to the exceptional work they had performed. 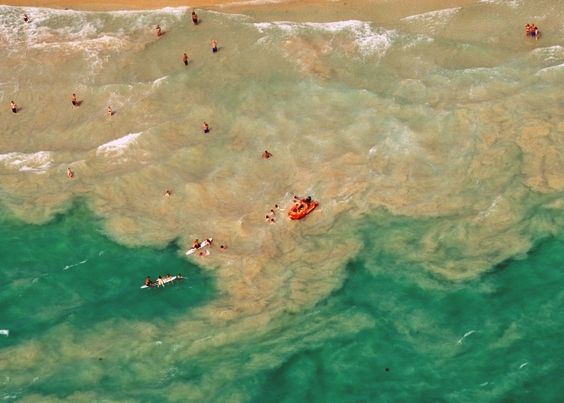 It was widely (and incorrectly) reported in the contemporary media that the Bondi Beach sandbank had collapsed, causing the swimmers to be stranded. In reality, sandbanks are large heavy deposits of sand, and while they shift around gradually from time to time, this process normally occurs over days or weeks. In very heavy surf, a sandbank might move 20 meters over several hours, but they don't suddenly collapse. Ocean waves tend to travel in sets of three to ten larger waves, separated by lulls. When those five or six particularly large waves arrived at Bondi, the water level above the sandbar would have increased rapidly, leaving swimmers out of their depth, and at risk of being swept into the deeper gutters or rips that run alongside the sandbar. Rips can quickly double their speed after a set of large waves has broken, since all the extra water that inundates the beach must find its way back out to sea again. Anyone washed into a strong rip can be quickly swept seawards. 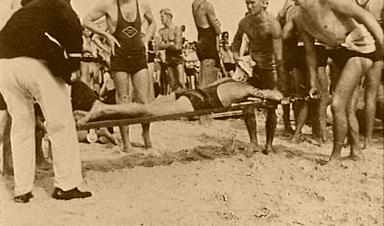 Lifesavers resuscitate bathers after freak waves hit Bondi Beach on Black Sunday, 6th February 1938. 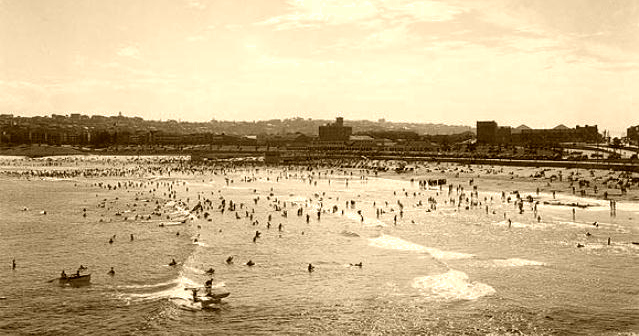 Surf reels were invented at Bondi Beach by John Bond, Percy Flynn and Lyster Ormsby. 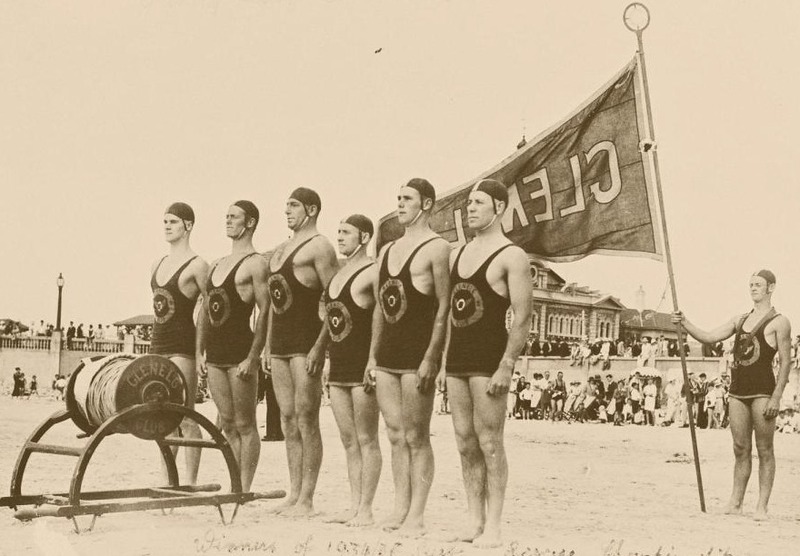 Pioneered by Sydney surf lifesaving clubs, they fed out a long rope attached to a belt, which was worn by a ‘beltman’ who swam out to people struggling in the water. Once they reached the patient, other lifesavers on the beach would haul them in. Reels are no longer used in modern lifesaving operations, having been superseded by rescue tubes, boards and IRBs. However, surf lifesaving reels are still used today at carnivals as part of the March Past event. In this event, teams of twelve lifesavers from each club march around a course carrying a reel and their club's flag.